Tommie Smith holding his fist up in defiance at the1968 Olympic Games. RIETI, Italy — When Tommie Smith bowed his head down and thrust a black-gloved fist toward the sky from the top step of the Olympic podium 45 years ago, he had made a personal decision to make a statement in the battle for human rights. With questions swirling over an anti-gay law in Russia, which will host the Winter Games in Sochi in February, today's athletes are faced with a similar choice, Smith said in an interview. "Athletes [have] got to make their own minds up," Smith said on the sidelines of an athletics meet Sunday in Rieti, where he was honoring the memory of recently deceased Italian sprinter Pietro Mennea. "It's always a question about issues. Like I was back in '68 when it was a human rights issue," Smith added. "Now it's a gay rights issue. They have to make their minds up how they feel about a particular situation. They need to figure it out. I won't do it for them. I have my own feelings." As a Christian from a biblical background, the 69-year-old Smith is not a firm supporter of gays. "Do I approve of it? I don't believe so, because I believe in the Bible, and it doesn't really give leeway in this," Smith said. "But there are people who believe in it because that is their belief, and I respect that belief." 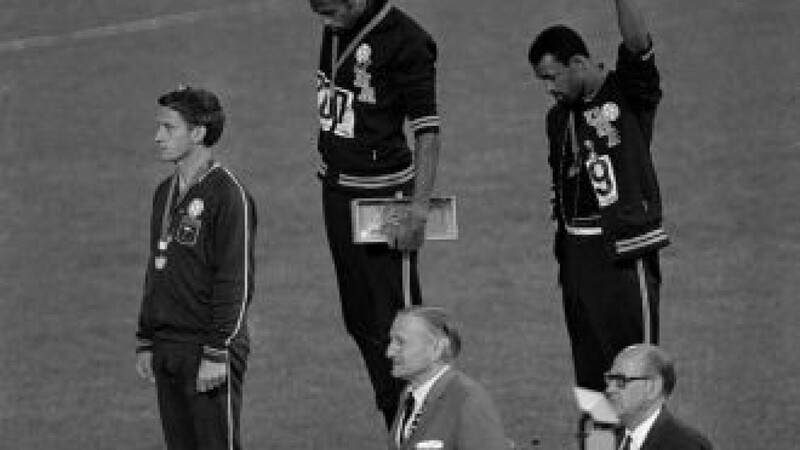 Smith won the 200 meters in world-record time at the 1968 Mexico Games, then was expelled from the games along with bronze medalist and American teammate John Carlos for their protest in the name of African-American civil rights during the playing of the Star-Spangled Banner. They returned home to threats and found themselves ostracized. Smith said athletes should not expect more leniency from the International Olympic Committee this time. "They [the IOC] counseled me into what I should or should not do. I did what I thought, and I suffered the consequences," Smith said. "It's simple and clear: If the IOC says no and they do [protest] they suffer the consequences. One way or the other. The IOC is the grandmaster of the Olympic Games — not the athletes." On Sunday, a senior IOC member said sponsors were "afraid" of the fallout of possible demonstrations in Sochi. "I think this could ruin a lot for all of us," marketing commission chairman Gerhard Heiberg said at the IOC general assembly in Buenos Aires, Argentina. "We have to be prepared." The controversial Russian law, which President Vladimir Putin signed over the summer, makes it illegal to expose minors to information that portrays these relationships as normal or attractive. The law imposes fines, while also subjecting foreign citizens to up to 15 days in prison. But Smith suggested that athletes had a better chance of effecting change if they band together. "Masses change things. Individuals are destroyed. Like what happened to me," he said. "The masses will change things. Otherwise we wouldn't have presidents — we would have chaos." And if they do decide to protest, Smith advises preparing a crystal-clear message. "Whatever language they speak, they should have their verbs, adverbs, adjectives and conjunctions together so people can understand exactly what they're saying," said Smith, who turned to coaching and teaching after his athletics career was derailed. For more than 30 years, Smith coached track and field and taught sociology and health, first at Oberlin College in Ohio then at Santa Monica College in California. He is retired from teaching now but still coaches and speaks in public. "I have a love for the educational process outside of the classroom," Smith said. "I teach from a universal level of my experiences and my sociological background." Smith's background of athletic prowess and politics led him to develop a close bond with Mennea, who broke his world record on the same Mexico City track 11 years later. Mennea, who died in March at age 60, was introverted as an athlete but got involved in politics after his track career and earned four university degrees. "Pietro Mennea was a hyper kid, fast twitched, long legs, long strides and a will not to lose," Smith said. "Off the track he was a politician. We got along well."